Primary lateral veins which contact the plexus at the base of the blade and the apex of the petiole are referred to as "basal veins" (Fig. 22) [See also Croat & Bunting, 1979]. While the uppermost 1 or 2 pair usually extend upward and into the anterior lobe where they join the antemarginal vein, most extend into the posterior lobes. Basal veins are divided into those which arch upward and those which curve into the posterior lobes (when these are present). Generally, basal veins are most well developed on plants which have posterior lobes and they are not present or at least not many in number when the blade lacks posterior lobes. Basal veins, like the primary lateral veins, are typically paired with usually an equal number on either side of the midrib. 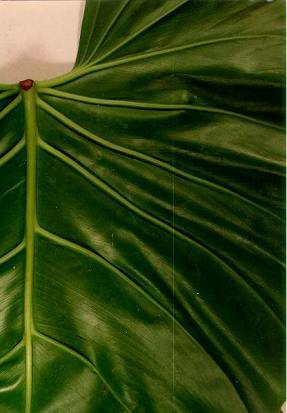 Seventy-three species (75 taxa) have basal veins among Central American P. subg. Philodendron. The number of pairs of basal veins present range from 1 to 15 but only seven species have ten or more pair of basal veins. Those species with ten or more basal veins include P. angustilobum, P. copense (to 15), P. findens, P. grandipes, P. thalassicum, P. pirrense, P. tutense, and P. strictum. Only five species have up to nine pair of basal veins, seven species range up to eight pairs, six up to seven pairs, 15 up to six pairs, 11 up to five pairs, nine up to four pairs, 13 up to three pairs. Most species have 3-6 pairs of basal veins. Though up to 16 species may have only two pair of basal veins. No species has two basal veins as its upper limit. Only three species, namely P. lentii, P. mexicanum, and P. scalarinerve, regularly may have a solitary pair of basal veins.